In 1908, American philosopher Josiah Royce foresaw the future. Race questions and prejudices, he said, "promise to become, in the near future, still more important than they have ever been before." Like his student W. E. B. Du Bois in Souls of Black Folk (1903), Royce recognized that the problem of the next century would be, as Du Bois put it, "the problem of the color line." The twentieth century saw vast changes in race relations, but even after the election of the first African-American U.S. president, questions of race and the nature of community persist. Though left out of the mainstream of academic philosophy, Royce's conception of community nevertheless influenced generations of leaders who sought to end racial, religious, and national prejudice. Royce's work provided the conceptual starting place for the Cultural Pluralism movement of the 1920s and 1930s, and his notion of the Beloved Community influenced the work and vision of Martin Luther King, Jr., and the civil rights movement. Communities, whether they are understood as racial or geographic, religious or scientific, Royce argued, are formed by the commitments of individuals to causes or shared ideals. This starting point-the philosophy of loyalty-provides a means to understand the nature of communities, their conflicts, and their potential for growth and coexistence. Just as this work had relevance in the twentieth century in the face of anti-Black and anti-immigrant prejudice, Royce's philosophy of loyalty and conception of community has new relevance in the twenty-first century. 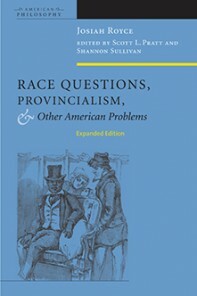 This new edition of Royce's Race Questions, Provincialism, and Other American Questions includes a new introduction to Royce's philosophy of loyalty and the essays included in the volume, and a second introduction connecting Royce's work with contemporary discussions of race.